Wayne Gretzky has been named global ambassador for Kunlun Red Star of the KHL, lending his name to the development of hockey in China. The team will open a Gretzky-named hockey school for children aimed to give the next wave of Chinese hockey players added coaching and opportunity. As the NHL continues to grow its brand around the world, the “Great One” will be a big part of that movement. This comes before the 2022 Winter Olympics are held in Beijing, a tournament that may or may not have NHL involvement. The league held its players out of the most recent Olympics, but could return to the format if a financial agreement can be worked out. Attending the Olympics is likely going to be a topic in the next CBA negotiations, which could come soon as both the NHL and NHLPA have opt-out clauses next year that could bring a work stoppage in 2020. Vladimir Tarasenko was back in action yesterday, giving hope to the idea that he’ll be ready for the start of the 2018-19 season. Tarasenko injured his shoulder at the end of last season and needed reconstructive surgery, but has been cleared to skate and can even take some contact. The 26-year old sniper will be re-evaluated in September, at which point the St. Louis Blues will know if they’ll have him for opening night. The Blues have brought in several offensive players this offseason, but will still rely on Tarasenko to drive their attack. Chris Ryan of NJ Advance Media spoke to New Jersey Devils owner Josh Harris about upcoming extension negotiations with Taylor Hall, who explained that it was the team’s highest priority. Hall has two years remaining on his current contract meaning an extension can be signed on July 1, 2019 at which point he could become one of the highest-paid forwards in the league. The 26-year old Hall carries just a $6MM cap hit at the moment, is coming off a Hart Trophy-winning season, and has a good shot at leading the Devils back to the playoffs again in 2018-19. The fact that an owner is willing to comment on the situation should give hope to Devils fans that the team will do everything in their power to keep Hall around for many years. Ansar Khan of MLive reported today that Ken Holland will return as general manager for the Detroit Red Wings next season. Though no formal announcement has been made regarding Holland’s expiring contract, Khan seems convinced that he will be the one leading the Red Wings in 2018-19. He also suggests that Jeff Blashill could also return as head coach, despite a relatively disappointing season that has the Red Wings just five points out of last in the NHL. Bringing Holland back would likely mean a new contract, and one that could take his name out of consideration for the job in a potential Seattle franchise. Though Holland has never indicated or even spoken about an interest in joining the expansion organization, there has been some chatter about his name as a leading candidate, especially one that the league would welcome. Detroit has some very interesting decisions to come this summer and down the road, as they try to navigate a rebuild for the first time in decades. Wayne Gretzky will be a household name in China if he isn’t already, that’s what Darren Dreger of TSN makes it sound like on the latest iteration of Insider Trading. Dreger reports that Gretzky will soon sign a deal to put his branding on everything from arenas to equipment in China as the country encourages more and more children to take up the sport. Gretzky is obviously still one of the most well-known names in hockey worldwide, and could still have a huge impact in the growth of the sport. Christian Ehrhoff has officially retired from professional hockey, but as John Vogl of the Buffalo News points out he’ll still be getting a paycheck from the Buffalo Sabres for some time. Ehrhoff, bought out in 2014 just three seasons into a ten-year contract, will remain on the Buffalo payroll through 2027-28. That’s another ten years from now, not bad for a player who only suited up 192 times for the Sabres over three seasons. Nikita Kucherov has joined some elite company. Becoming only the fourth player in the last 30+ years to do so, Kucherov notched a goal in his seventh straight game. He joins powerhouse names like Mario Lemieux, Mike Bossy and Wayne Gretzky as one of only six players during the modern era to score in each of his team’s first seven contests. When asked about his scoring prowess yesterday, Kucherov shrugged it off, stating how the “W” was far more important than individual accolades. He now has eight goals on the season. The Lightning, a preseason favorite by some to win the Stanley Cup, have been on a tear to start out the season. Buoyed by Kucherov’s hot start, the Bolts are off to a 5-1-0 start. While it is early, it’s certainly of note to see what a healthy Tampa Bay squad is capable of doing. Only in his fifth season, Kucherov was a second round pick (58th overall) in the 2011 draft. Since the 2014-15 season, Kucherov has posted 60 or more points, culminating with 85 (40-45) last season. With 10 points in just six games (7-3), Kucherov seems to be on his way to another dominant year. Twenty-nine years ago today Wayne Gretzky was traded from the Edmonton Oilers to the Los Angeles Kings in a deal that would change the fate of hockey in Southern California. All of a sudden the greatest player of all time was playing in a non-traditional hockey market. NHL.com’s Lisa Dillman chronicles the trade, and how Gretzky was feeling at the time. When looking back at the deal, many fans remember the $15MM price tag paid by the Kings and equate the deal to a purchase from the less-wealthy Oilers franchise. But there were other parts that should be remembered. Los Angeles also traded Jimmy Carson, a 20-year old former second-overall pick who was coming off a 55-goal, 107-point season, Martin Gelinas the seventh-overall pick from just a few months earlier, and three additional first-round picks. That’s in addition to the $15MM, while the Oilers also sent Marty McSorley and Mike Krushelnyski south along with Gretzky. It was lopsided for sure because of Gretzky’s greatness, but the return shouldn’t be minimized. It was likely the biggest trade that will ever happen in the NHL. According to CTV News in Calgary, former NHL star Dany Heatley has won a court decision over his former agent for losing a large part of his career earnings, given a judgement of just over $6.5MM. Apparently Heatley won a similar court case in the past and was never paid, so it is still to be seen whether he actually gets it. Chris Phillips, Heatley’s former Ottawa Senators teammate who used the same agent also sued in the past and was given a judgement of over $7MM, though was only paid a fraction of the settlement. Winnipeg Jets’ prospect Logan Stanley was traded from the Windsor Spitfires to the Kitchener Rangers yesterday for a package of picks. The huge defender was selected 18th-overall in 2016 and won a Memorial Cup after coming back from injury just in time to compete in the tournament this spring. Windsor, with the hosting duties behind them and several players graduating to the NHL will look to rebuild their franchise and try to time a championship winning group a few years down the line. The Washington Capitals will be playing their home games in the Capital One Center this season, as Dan Steinberg of the Washington Post reports. The Verizon Center’s naming rights were up at the end of 2018, but will change a year early. 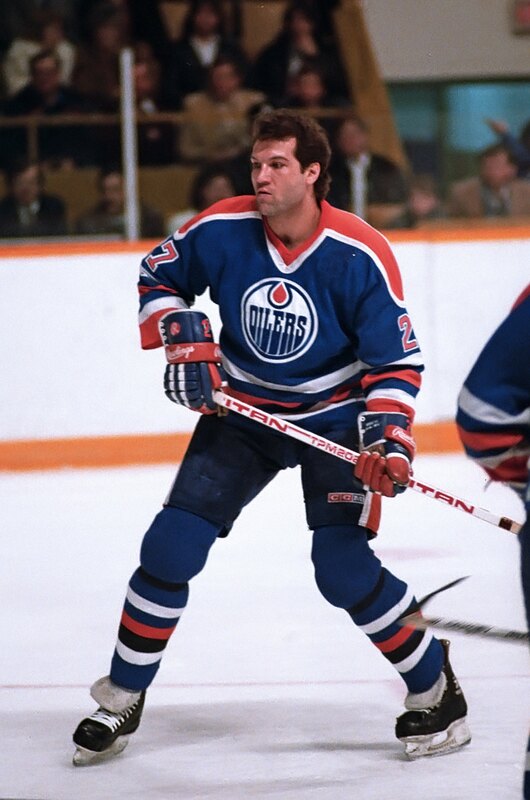 It is with great sadness we announce the passing of Oilers legend Dave Semenko after a short, but courageous battle with cancer. Dave will be remembered as a fierce competitor, loyal teammate, fan favorite and dear friend to so many. His legendary toughness on the ice is surpassed only by his kindness and caring for others, and his equally legendary wit and sense of humor. Semenko was a force for the Oilers in the 1980s, riding shotgun with Gretzky to make sure no opponent took any cheap shots. His role was clear, but it didn’t stop him from enjoying when he did score. In fact, he tallied the final goal in WHA history before Edmonton was absorbed into the NHL, a tap-in at the side of the goal with just 12 seconds left in the final Championship game. The Winnipeg Jets would win that game and the title, but Semenko would get his revenge a few years later when he and the Oilers hoisted back-to-back Stanley Cups in 1984 and 1985. Our former colleague Brett Barrett, who now works for Global News in Edmonton, grew up an Oilers fan and put it simply when asked. It’s true, Semenko was spoken highly of by nearly every single person in the hockey community, mostly mentioning his genuine sense of humor and good nature, despite the angry monster he was on the ice. Semenko had worked in radio, as an assistant coach and in a scouting capacity since retirement and even played in the recent alumni game between the Oilers and Jets. He’ll by missed by everyone who cheered in awe of him both for and against, and everyone here at PHR wishes his family the best through this tough time. After going to the playoffs three consecutive years from 2010-12 the Arizona Coyotes have taken a sharp downturn in recent years, culminating in another disappointing season in 2016-17. They finished in 28th place with just 70 points, and unfortunately dropped all the way to seventh in the upcoming draft. Since most of their impressive assets are still very young, the team shouldn’t have much trouble protecting their future in the upcoming expansion draft. They do however have some interesting names that may be taken. Like the Colorado Avalanche who we profiled yesterday, the Coyotes have more than enough protection slots to go around up front. Unlike the Avalanche though, who have a tough situation on defense the Coyotes will more than likely use the 7-3-1 method, allowing them to protect all of their valuable contracts. Up front, the Coyotes amazingly have just three players signed for next season who are eligible to be taken, though several other restricted free agents will warrant protection. With seven slots, they actually have enough to even acquire another player or two without putting anything of true value at risk. Holland, Martinook, and Jooris all have shown various levels of upside in their NHL time, while others like Pulkkinen have performed well at the AHL level. Because of the extremely few veterans signed for next season, the Coyotes actually still have some work to do. Each team needs to expose at least two forwards who are under contract for 2017-18 and played in at least 40 games this season of 70 the past two. McGinn, Rieder and Richardson are the only three who are signed, meaning another player will need a contract before the draft happens. Jooris is the most likely for this, as he doesn’t project as one of their current protected forwards but does fill the requirement. On defense the biggest loss would likely be Schenn, the former fifth-overall pick who is now on his fourth organization without ever living up to the shut-down billing he had coming out of the WHL. If the team was worried that Vegas might take him—and there is definitely a chance the team would, seeing as he is a cheap 27-year old with more than 600 games under his belt already—and they really didn’t want that, they could go with the eight skaters method and protect four defensemen, though it seems very unlikely. We’re trying to grow, and he’s a key cog of that growth for us. Wayne Gretzky was traded. At the same time, [Smith’s] an important piece for our organization. There’s no discussion on him. That does make Domingue an interesting option for Vegas, as the former fifth-round pick has turned in two solid seasons in part-time duty. While he doesn’t have the same immediate upside of Antti Raanta or Philipp Grubauer (two goaltenders who may also be exposed), Domingue is only 25 and costs just over $1MM for next season. It’s important to note that Dave Bolland, Craig Cunningham and Chris Pronger, all of whom are technically still on the Arizona payroll are exempt from the draft due to their career-ending injuries. Pronger has in fact already been inducted to the Hall of Fame, and currently works for the Department of Player Safety. Pavel Datsyuk, whose rights were acquired at the draft last year is also on the books and has a no-movement clause, but will not need protection because of his expiring cap-hit and status as a retired player. 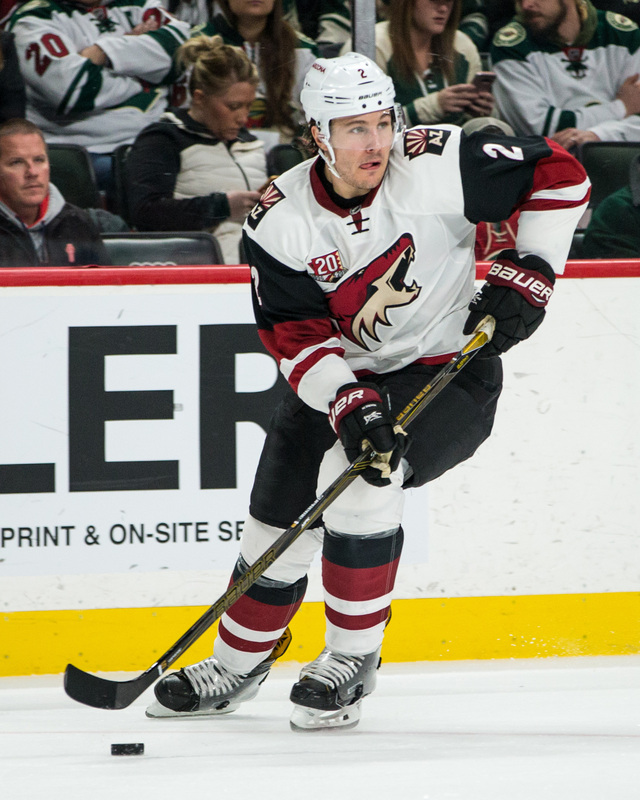 Vegas will have a chance to speak to the pending free agents for the Coyotes like any other team, and there is the possibility they could go after Radim Vrbata instead of any exposed player. Vrbata had a solid season in the desert, leading the Coyotes with 55 points. At 35 he’s clearly past his prime, but for a team that will severely lack scoring ability he may be an interesting option. 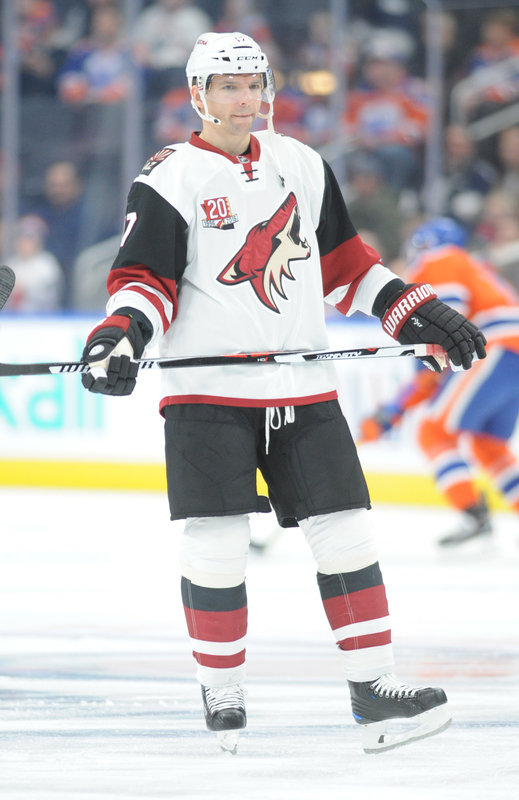 Shane Doan is also a free agent as of this moment, but it seems unlikely that he would go to Vegas for the end of his career—if it’s not over already—after making it clear he only wanted a trade to a potential Stanley Cup contender at the deadline. In all, the Coyotes sit in outstanding shape going into the expansion draft without much to lose. Since all of their highly-touted assets are still too young to be eligible, they’ve actually put themselves in a situation to acquire a player or two before the draft from a team in a worse situation. Though they aren’t likely to compete next season, they could easily add young players to their core this summer to make their team substantially better. Like the acquisition of Crouse last summer in exchange for Bolland’s contract, or the draft-finagling to move up and get Chychrun, Chayka and the Coyotes front office is headed in the right direction. It would be surprising to not see them take advantage of their protection slots and ample cap space again over the next few weeks. While this list reflects the roster as it is today, it could clearly change as the team makes the decision on who to extend or a deal to bring someone in. As it sits, Schenn or Domingue look like the toughest losses, which won’t really inspire much excitement among Golden Knights fans. On a quiet night for hockey news other than the two Eastern Conference playoff games, Nick Kypreos and Elliotte Friedman used the second period break of the Penguins-Capitals contest to update the hockey world on the ongoing business of another Eastern Conference team. While Pittsburgh fans are hardly thinking of front office issues as their team appears to be on the fast track to second consecutive Stanley Cup appearance, the news certainly affects the Penguins as well. Kypreos revealed that, as has been expected, the Buffalo Sabres are likely to announce that Pittsburgh executive Jason Botterill will be their next General Manager. Friedman then chimed in that, with Botterill likely at the helm, Penguins assistant coach Rick Tocchet is a strong candidate for the open head coaching gig. Kypreos suspects that they could be waiting until after the end of the Penguins’ current series to announce at least Botterill, if not both if discussions have already been had about Botterill’s coaching choice. The Botterill story has been told: a younger executive working for one of the most successful franchises in the game and eager for a new challenge and his turn in the spotlight. Botterill is also an expert on hockey analytics and salary cap analysis – a GM for the new age of hockey. Botterill has had two interviews with the Pegulas and other decision-makers in Buffalo and it seems that the job is all but his. The Tocchet note though is new. Tocchet enjoyed an 18-year NHL career before becoming a coach, playing for six different teams, being selected to four All-Star Games, and winning the Stanley Cup with the Penguins in 1992. Tocchet was well-traveled and also well-rounded, capable of fitting into nearly any system he was part of. That versatility and two-way hockey intelligence translated well into coaching, as he has a broad understanding of the game. Tocchet was named an assistant coach for the Colorado Avalanche, a team he had never played for, less than a year after officially announcing his retirement from playing in 2002. He then moved to Phoenix to be an assistant under Wayne Gretzky, before moving to Tampa Bay in 2008 as an assistant for Barry Melrose. Tocchet replaced Melrose that same season and was the head coach of the Lightning for next two years, but was fired in 2010 with a 53-69-26 record. Tocchet was given a second chance by his former team in 2014 when he was brought on as an assistant coach for the Penguins by Mike Johnston. Tocchet outlived his head coach and the work he has continued to do for the Penguins has been praised by replacement Mike Sullivan and, of course, owner and former teammate Mario Lemieux. With Botterill probably getting a fresh start and his first GM gig, it doesn’t seem unlikely at all that the first coach he hires is someone experienced who he is also familiar with and Tocchet fits the bill.